"Islam cannot be either 'moderate' or 'not moderate.' 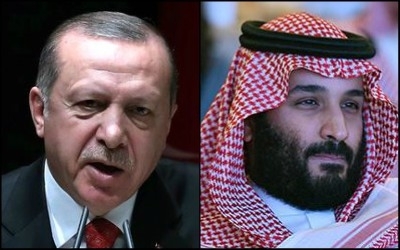 Islam can only be one thing," Turkish President Recep Tayyip Erdogan (left) said last month, two weeks after Saudi Crown Prince Mohammed bin Salman (right) pledged to promote a "more moderate Islam" in his kingdom. Turkey's strongman, President Recep Tayyip Erdogan, may have exhibited all possible features of political Islam since he came to power fifteen years ago, but at least he has been bold and honest about his understanding of Islamism: There is no moderate Islam, he recently said again. This comment does not mark any U-turn, or a radical deviation from his earlier freshman-self back in the 2000s. The problem is that his Western "allies" have stubbornly preferred to turn a blind eye to his poster-child Islamism. Worse, they still do. Several years ago, Erdogan's ideological-self clearly stated that "Turkey is not a country where moderate Islam prevails." In the same speech, his pragmatic-self -- the one that wanted to look pretty to a chorus of Western praise -- added that, "We are Muslims who have found a middle road." But which "middle road?" In the several years that followed, Erdogan proudly exhibited another feature of Islamism in a make-believe assertion: Muslims never do wrong; if a Muslim does wrong then he is not Muslim. In 2009, when Sudanese paramilitaries committed acts of genocide against the population of Darfur, and Sudan's president, Omar al-Bashir, was guilty of the crimes for which he was indicted by the International Criminal Court, Erdogan simply said: "It is not possible for those who belong to the Muslim faith to carry out genocide." Instead, he said, Israeli "war crimes" in Gaza are worse than anything that has taken place in Sudan. As he said that, victims in Sudan had already numbered in the hundreds of thousands. Erdogan famously claimed that "there is no Islamic terror" in 2010. In February, at a meeting in Ankara, Erdogan slammed German Chancellor Angela Merkel's phrase "Islamist terror." He angrily said to his guest, "Islam means 'peace,' it can't come with 'terror'." When Erdogan (then prime minister) famously claimed that "there is no Islamic terror" in 2010, the satire website Zaytung fabricated a story, the lead paragraph of which read: "Erdogan's claims that 'There is no Islamic terror' have left several Islamic terror organizations heart-broken. A press release from al-Qaeda's press office read: 'The prime minister's remarks are very discouraging. We are doing our best!'." In 2011, when Hamas' charter called for the annihilation of the State of Israel by means of violence, Erdogan claimed that "Hamas is not a terrorist organization." Instead, he said: "I don't see Hamas as a terror organization. Hamas is a political party -- it emerged as a political party that appeared as a political party. It is a resistance movement trying to protect its country under occupation." In a similar show of ideological wishful thinking, Erdogan has often come out in defense of the Egyptian Muslim Brotherhood, despite international pressure against the movement, particularly from the United States, which has debated listing the group as a terrorist organization. Erdogan said he did not consider the Brotherhood one because "it is not an armed group, but is in actual fact an ideological organization." In a 2010, President Obama praised Erdogan's Turkey as a "great Muslim democracy." The Obama administration sounded as if it were trying to deal with the Turkey it wished it had, instead of dealing with the Turkey it had. In a 2010 interview with the Italian daily Corriere della Sera, Obama referred to Turkey as a "great Muslim democracy." Obama should have seen that a democracy is a democracy -- without any religious prefix. He would see in later years the difference between a democracy and a Muslim democracy. But it took Obama many years to see that. In 2011, Tom Donilon, Obama's former national security advisor, said that the U.S. president regarded Erdogan as "a man of principle, and also a man of action." In a 2012 Time interview, Obama named Erdogan as one of the five world leaders with whom he had the strongest bonds. The U.S. can either deal with the Turkey it has or the Turkey it wishes it had. The Trump administration has two options: It can either deal with the Turkey it has or the Turkey it wishes it had.